WELCOME TO FORGOTTEN BUFFALO. HISTORIC & HIP. An Urban Explorer's Guide to the Buffalo-Niagara Region: Unique Landmarks, Historic Gin Mills, Old World Neighborhoods, History and More! REAL people. REAL places. Click image to read Polonia Power! 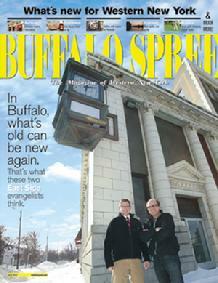 Historic & Hip...Welcome to Forgotten Buffalo & Tours! We are the region's authority on unique landmarks, classic taverns, old world neighborhoods & "Nickel City" oddities. 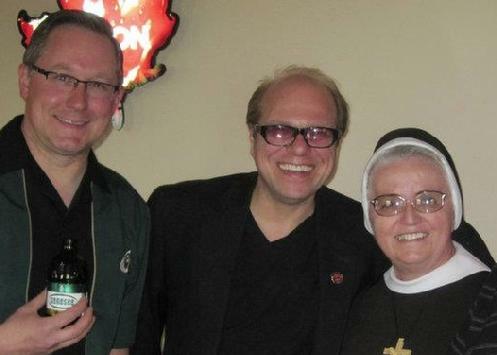 Eat, Drink & Laugh through history on Buffalo's original "Off the Beaten Track" tours. Your guides are television and radio personality Eddy Dobosiewicz, and trained Buffalo architecture and history docent Marty Biniasz. Each custom designed tour provides a sense why Buffalo-Niagara is one of the most unique urban communities in the world. 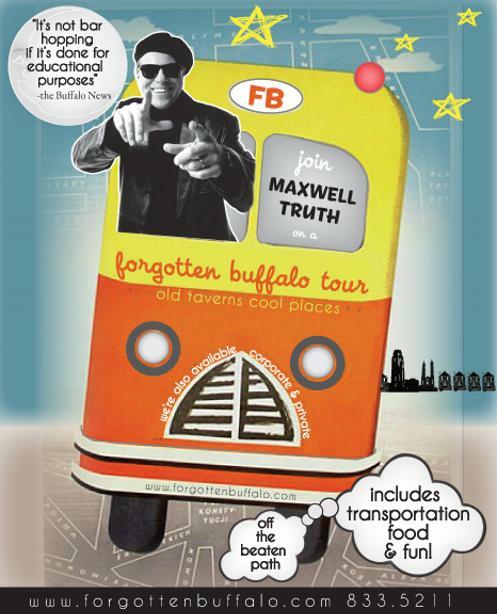 FIND OUT ABOUT FORGOTTEN BUFFALO TOURS & OTHER COOL STUFF WHEN WE DO! Forgotten Buffalo Tour May 2011: A Polonia Pride tour stops at the R&L Lounge. Click image to learn more. "It�s not bar-hopping if it�s done for educational purposes!" "Hands down, the BEST local entertainment can be found on a Forgotten Buffalo bus tour!" EAT... DRINK... & LAUGH... THROUGH BUFFALO HISTORY! Forgotten Buffalo Tours: Urban Explorers visited the Corpus Christi Bowling Alleys on April 26 as part of the Secret Societies and Private Club tour. Click image for more tour pictures. Downtown Buffalo home of Flexlume Neon Company. A Buffalo tradition since 1904, this historic neon since dates from 1946. 1464 Main Street. ForgottenBuffalo.com: An urban explorer's guide to the Buffalo-Niagara region. Learn about unique landmarks, classic taverns, old world neighborhoods, historic 20th century sites and Nickel City oddities! Forgotten Buffalo hopes to provide visitors with an uniquely Buffalo experience. Visit sites that have been left behind, or perhaps clandestinely left in place, providing clues as to what was there before. In an age where life continually looks at renewing and reinventing itself every few decades, Forgotten Buffalo takes pride in the Niagara Frontier's triumphal past. Look beyond predictable tourist sites...Discover treasures in historic neighborhoods with unique names like Polonia, Black Rock, Kaisertown and the First Ward. Tour relics from the regions mighty industrial past and strongholds of the American ethnic experience. More than just a nostalgic trip through time, Forgotten Buffalo allows you to better understand why Buffalo is one of the most unique urban communities in the world. It's definitely a city worth exploring! Enjoy! Witam! Nazywamy sie Martin Biniasz i Edziu Dobosiewicz. Mieszkamy w Buffalo, stan Nowy Jork, niedaleko Wodospadu Niagara Falls i granicy z Kanada. Czciabym na tej stronie pokazac zycie Polonii w Buffalo jak rowniez przedstawic informacje na temat rodziny BINIASZ i DOBOSIEWICZ. Obecnie zbieram material o pochodzeniu moich przodkow z Polski, ktorzy przyjechali do Ameryki w latach 1880 - 1950. Jesli posiadasz jakiekolwiek informacje o rodzinach : Biniasz, Biniarz, Dobosiewicz, Lemieszek, Lipinski, Kozurkiewicz lub Kolodziej, bardzo prosze napisz do mnie pod adres: ForgottenBuffalo@aol.com. W przyszlosci, bede tu zamieszczac informacje pomagajace innym ludziom w poszukiwaniu korzeni przodkow w Polsce. Dziekuje bardzo. Gr��e und vielen Dank zum Besuch bei meinem Website. Ich m�chte mit jemandem um die Welt korrespondieren, wer das Familiennamen "Biniasz" teilt. Ich wohne zurzeit in Buffalo im Staat New-York in den USA. Buffalo befindet sich in der N�he der Kanadagrenze, etwa 40 km von der St�rze Niagara entfernt. Wenn Sie irgendeine genealogischen Informationemn teilen m�chte, bitte schicken Sie es mir durch E-mail an ForgottenBuffalo@aol.com. Es wird sehr aufgewertet werden, und ich freue mich darauf, von Ihnen zu h�ren. Salut! Merci d'avoir visit� mon site. Je m'int�resse � communiquer avec celles personnes autour du monde dont les familles s'appellent Biniasz. Mes a�eux ont immigr� aux Etats-Unis entre les ann�es 1880 et 1909. J'habite actuellement � Buffalo, New York, ce qui se situe tout pr�s de la fronti�re canadienne environ 40 km de la chute Niagara. J'en serais appr�ciatif si vous auriez des renseignements g�n�alogiques � partager. Pri�re de me toucher � ForgottenBuffalo@aol.com. Je tiens beaucoup � faire votre connaissance.